This wall hanging "Hotel Capri" shows a picturesque seaside scene of the island of Capri. Capri is an island in the Campania region of Italy, and the main city has the same name. This island is known for its beautiful buildings as well as natural scenery beside the Tyrrhenian sea. It is so beautiful that it has been the setting and subject of much art and literature over the centuries. 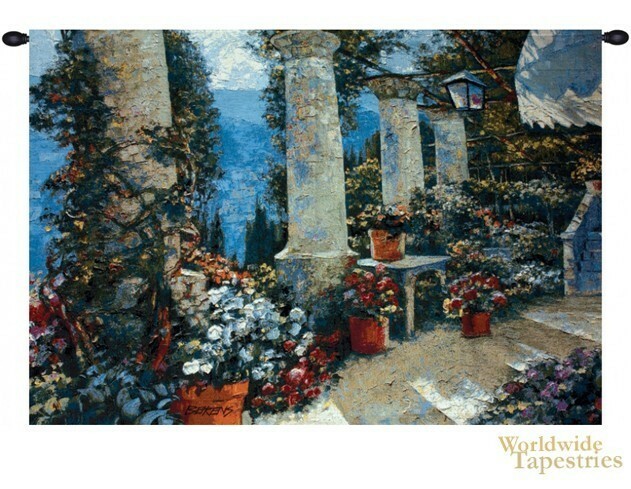 In this tapestry we see a decorated stairway of a hillside villa with columns decorated by potted and climbing flowers, with the coastline beyond. This cityscape tapestry "Hotel Capri" is backed with a lining and has a tunnel for ease of hanging. Note: Tapestry rods, where pictured, are not included in the price.